Communication junior Shane Eichstaedt shares their experience with bipolar disorder at the Rock. 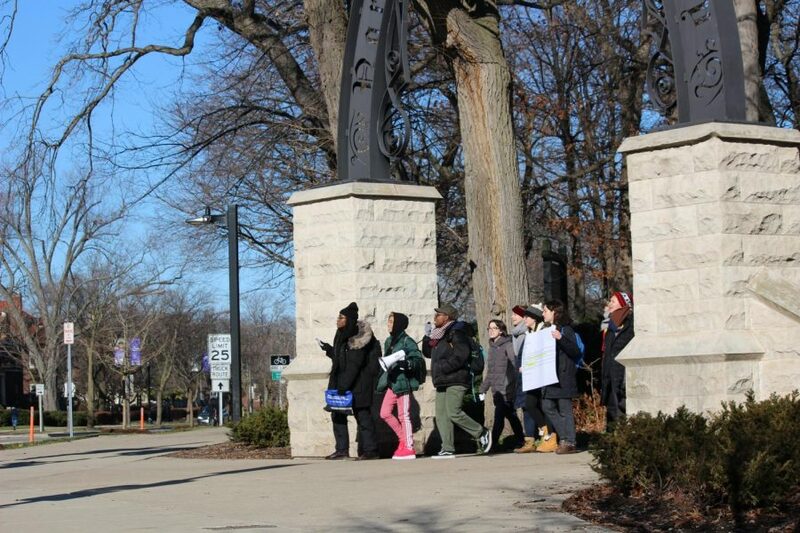 Many students spoke about their negative experiences with mental health at Northwestern at a rally in December. 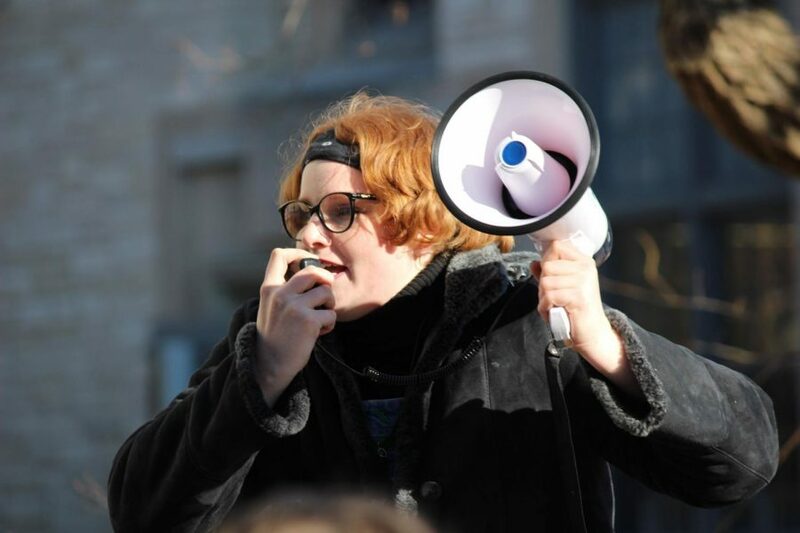 Student activists lambasted Northwestern’s handling of mental health issues and urged for increased inclusion and transparency in helping students cope with mental health problems, presenting a list of demands to Vice President for Student Affairs Patricia Telles-Irvin during a rally Thursday. The rally follows what protestors called a concerning years-long pattern of inaction and apathy from the University regarding students’ struggle with mental health and student suicides. Students said the school needs to focus on increasing diversity in its counseling staff, and that Northwestern’s preoccupation with its prestige comes at the sake of students’ well-being, drawing a comparison to an employer exploiting employees. Around 60 students gathered at noon at the Rock to share personal stories before marching to the Rebecca Crown Center and listing demands directly to Telles-Irvin, who came outside around 1 p.m. after protestors demanded she come down from her office and address their concerns. “If y’all care so deeply, how the hell does that formulaic (loss in our community) email that I’ve read, I don’t know how many times, that literally physically made my body fill with f–king rage, how the hell does that communicate care to me?” a protestor asked. Telles-Irvin declined an interview request after the event Thursday evening. The list of 10 demands includes a funding increase for Counseling and Psychological Services, the hire of additional counseling staff who hold salient marginalized identities and a decrease in the number of credits required to receive undergraduate degrees. Less than a day before the rally, Telles-Irvin sent an email to the Northwestern community announcing the University’s plan to hire two new staff members to work at CAPS and University Health Services — these new staff members will focus on screening students at high risk for suicide and allow other staff to focus more on students in later stages of treatment. The email also mentioned the creation of a task force, scheduled to meet in January, to address improving mental health on campus. But students viewed the announcement was a reaction to their circulation of flyers inviting people to the rally rather than a genuine attempt to improve students’ well-being. They also said the process to decide to hire two new staff members at CAPS was problematic because it happened behind closed doors and didn’t include students’ voices. In particular, students called for counselors who are people of color or hold an LGBTQ+ identity. Students also said they aren’t convinced the addition of new positions will help fix the larger institutional culture surrounding mental health, calling Telles-Irvin’s email a “band-aid solution.” They criticized the creation of the task force addressing mental health, claiming that private meetings wouldn’t change the University’s institutional attitude. Some students also told the crowd that administrators had inadequately addressed their concerns about students’ mental health during private meetings. They said administrators downplayed the significance of the problem. The students who organized the event told The Daily they wished to remain anonymous to avoid backlash from the University — last year administrators pursued conduct action against students for disrupting a talk by a visiting Immigration and Customs Enforcement representative. Some students attending the rally said they were surprised at the event’s emotional rawness and impressed by the activism. Ben Schacht, a comparative literature doctoral student, said it was “moving” to hear students truthfully talk about their personal experiences during the open mic. At times tearing up and choking, students spoke at length about their experience with child abuse, post-traumatic stress disorder, bipolar disorder — and about their frustrating experiences with CAPS. During their speeches they received snaps, claps and cheers as their words resonated with the audience. Protestors emphasized continuing to put pressure on the administration, saying true change would only be produced if students continued to voice their outrage.